Engagement is a hot topic. For those of you who have heard me speak, you know I think not all engagement is created equal and there is far too little focus put on the purpose behind the engagement. You can have high engagement and very little value - look no further than the comments on a general news site. The other common problem is you have no engagement at all, which happens far too frequently inside organizations where people feel like the only outcome of sticking their head up is becoming a good target. What's interesting is that in most cases we diagnose the issue as a tactical one - we aren't providing good enough tools or spaces for people to engage in a constructive way. The more sophisticated organizations realize that tools alone won't solve the problem and have started investing in the operational systems that include community management roles and training to ensure that when people engage they get real value from it. This is where I spend a lot of my time - helping companies understand how to build systems of engagement. But it's not a complete solution either. Ultimately, to sustain engagement, the business model needs to generate more value for each of its stakeholder groups than they contribute. People need to feel like investing and contributing to the ecosystem will return disproportionate rewards to them. If it does, they will return to engage again and again and again. The implications to business models are quite radical, however, and in a way most organizations cannot accept given their current leadership. This type of business model requires the organizations themselves to recognize revenue and value only after it has ensured each stakeholder group has gotten more value than it has contributed. Typically, organizations work to recognize as much value as possible, as soon as possible; when is the last time you heard a sales executive say 'We don't get paid until our customers feel like they have won'? This mentality leaves stakeholders feeling combative, not collaborative - whether they are customers or employees - and that does not lead to organic and frequent engagement because those stakeholders don't see the organization's success and their success as the same thing. However, those organizations that do have the patience to be generative - making their stakeholders success a key part of their own business model - tend to reap far more in the end because every one of their stakeholder groups has a vested interest in their success. To me, that is a #winning strategy. Communities have been around since the beginning of time and online communities sprung up very soon after the Internet was developed. Humans have a visceral need to seek out commonality and connect around shared interests - and it is so instinctive that most people cannot articulate how communities come together and thrive. Because of this community management - and prior to that community development - has been seen largely as an art, learned through experience. This is the culmination of one of my primary goals when starting The Community Roundtable and I couldn’t be more excited to share it because I believe that a co-creation is the future of organizations - identifying shared goals and then building solutions together. Because of this, the future of all management is community management and it’s a critical strategic competency for organizations to develop. Getting to Yes is a great book about negotiating in a way that serves the interests of both parties. It is also the implicit goal of everyone who needs to collaborate with others in some way. For most of my professional life, the goal of getting to an agreement has been the pulse of almost everything I've done. It's a noble goal. But yes is a horrible relationship builder. Yes is easy. I know - I'm a recovering people pleaseer - it is so much easier to say yes. Even when it's distracting, time-consuming, against your nature and counterproductive. It also sweeps issues under the rug - to mold, fester or dry up. When we say yes we withhold our perspective and concerns, which are infinitely valuable for the other party to understand. When we say yes, we withhold the gift of our truth and make it harder for the other person to be self-aware. When we say yes easily, it is impossible to understand whether interests of both parties are really aligned - and therefore it is a risky, risky yes. Flipping the dynamic I realized that how someone responds to no is a powerful indicator of the character of the other party and the potential of a relationship. Why wouldn't you want to figure that out as quickly as possible? Most people don't take no very well and that is kind of a bummer because saying no means ending those conversations and arresting those relationships. 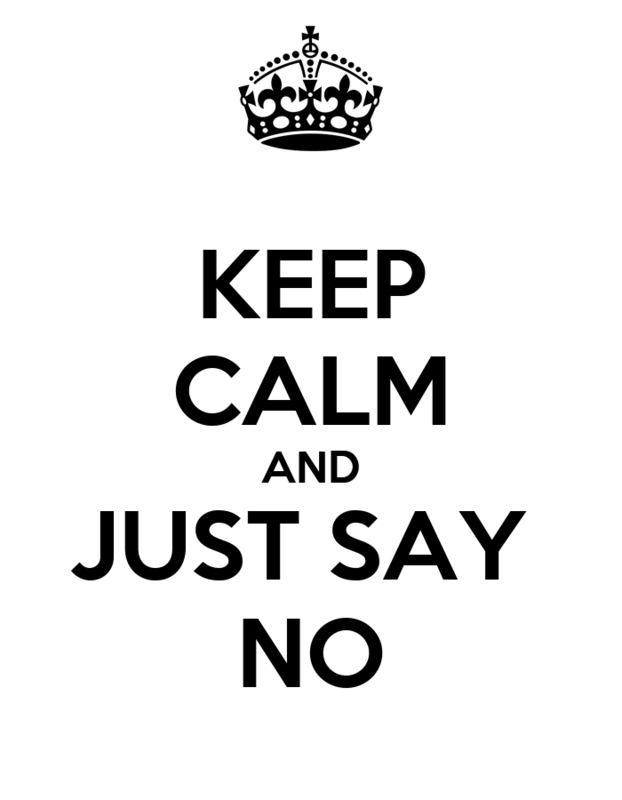 But when you say no and instead of someone disengaging, they respond by digging deeper to find where you can collaborate, it opens up a world of possibilities and potential. Those are the relationships that transcend transactional exchanges and lead to rich collaborations where everyone wins. I want more of those relationships and the best way I know how, is to get to no as quickly as possible.